This article first appeared in The Edge Financial Daily, on June 28, 2018. For London-based jeweller Jessica McCormack, the inspiration to make elaborate, attachable shells for solitaire rings came from her own jewellery box. “It all started with the ring from my husband’s great-grandmother,” she said. McCormack set to work on making what she now calls a “party jacket” for the formal diamond solitaire ring so it could be worn in a wider variety of situations. The piece was important to her family, but it did not see a lot of use. “I also had many clients who had old diamond rings sitting unworn, but not unloved, in their safe,” she said. McCormack will take an existing ring and create an outer shell that snaps easily over it, with additional stones, intricate metalwork, or even moving pieces to catch the light. Bigger brands, such as Jared the Galleria of Jewelry or Kay Jewelers, sell rings that combine two pieces in one — a solitaire for everyday wear and a matching shell for when the wearer wants to spice things up. The same trend exists in earrings: A pair of studs can be augmented with tassels, bangles or even a frame of smaller stones. 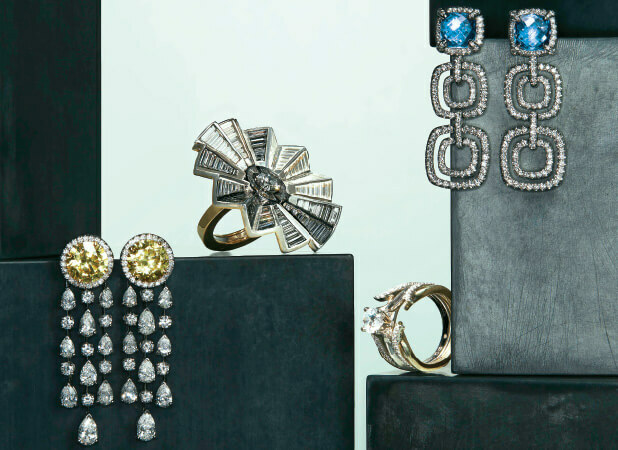 Double-duty earrings are a mainstay in the collection of London jeweller Kiki McDonough. The designer was inspired by situations that kept coming up in her own life. “I was at my son’s soccer game and had to very quickly change into evening wear,” she said. “I wanted earrings I could wear with my jeans and dress them up to go out to dinner.” McDonough, whose family has been in the jewellery business for four generations and whose creations are favourites of the Duchess of Cambridge, makes more than 35 drops that can be attached to three styles of hoop earrings. “You can literally carry the drops in your bag and then pop them on when you are leaving the office,” she said. Diamond purveyor Forevermark is getting in on the trend, too. It has collaborated with jewellry designer Jade Trau to create its Alchemy collection of detachable drops for both round- and emerald-cut diamond studs.